The Three Day Quote Challenge continues! I couldn’t NOT include a quote by naturalist and conservationist John Muir. When I lived and worked in Houston, I would pack my lunch and go outside when it wasn’t too hot. Right next to our building was a large grassy area with park benches and a fountain. Sometimes in the elevator a co-worker would ask me what I was doing. Many times I heard, “Wow, I’ve never done that.” Here was a lovely strip of nature right outside the office, and people frequently ignored it. After many hiking vacations, we could no longer live indoors with air conditioning. The pull of fresh air and the woods grew too great, and we moved to western Washington where we could be outdoors as often as we want. Doctors and mental health researchers, more and more, are looking at the physical and mental benefits of time in nature, and there are numerous articles such as this one online. Nature Deficit Disorder is a popular phrase these days after Richard Louv wrote Last Child in the Woods. I don’t need a study, though, to tell me how much it matters for me to connect with the great outdoors every single day. Outside, whether I’m in the garden or walking the many wooded trails that wind through our town, I am at peace. Some days I have to drag myself out there, but five minutes later I’m rejuvenated. Throughout my day, between bouts of writing or research, I’m out the door. Here, in a small town, I can connect with sunrises and sunsets, with equinoxes and solstices, with subtle shifts of temperature that tell me of a change in seasons or an early spring. Maybe if our politicians and lobbyists spent more time outdoors, our national priorities would be different. Now, if you’ll excuse me, I have berries to pick. How about you? 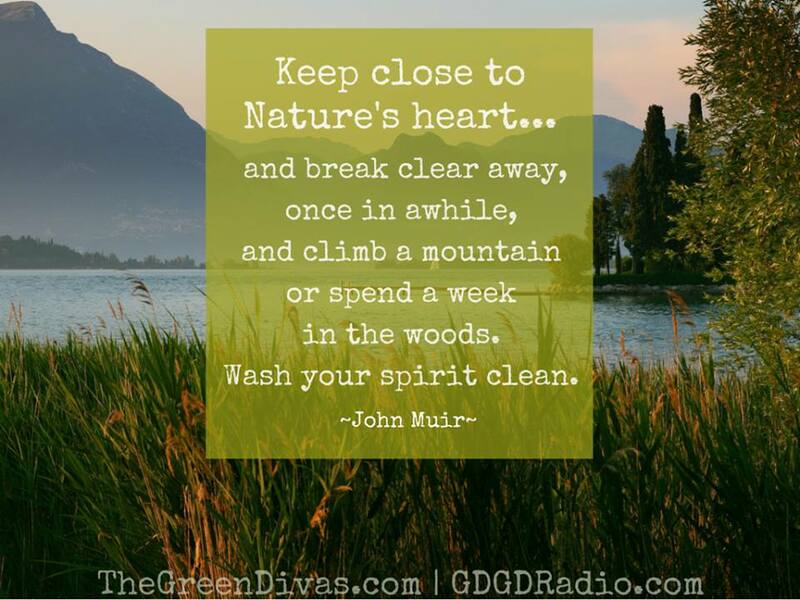 Do you get to spend time in nature? What’s your favorite outdoor activity? I don’t do “projects.” I do long-term relationships. I started my novel-in-progress more than two years ago, and it’s just now shaping up enough for me to think about sending it to an editor. Lord knows when it will be done, though I’m hoping by year-end. I’m forever walking the line between optimism and soul-crushing disappointment as I live with this story over and over and over and over again. That’s why it’s nice to finish something, anything. And to finish a large project, well, that’s particularly exciting. So today I reveal to you a new bedspread, a year and a half in the making. 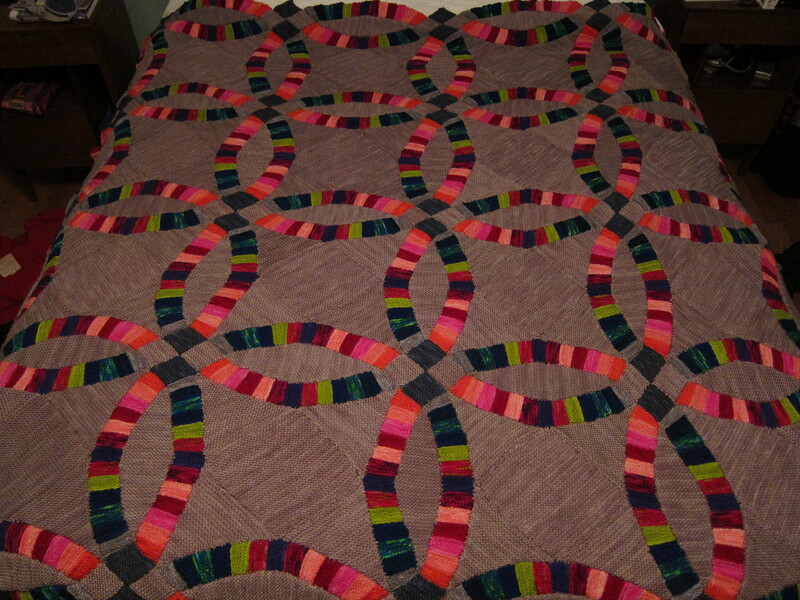 The pattern of the double wedding ring is common in quilts, but this is a knitted version. Turns out that for the cost of the yarn, I could have bought a hand-made Amish quilt, already done. 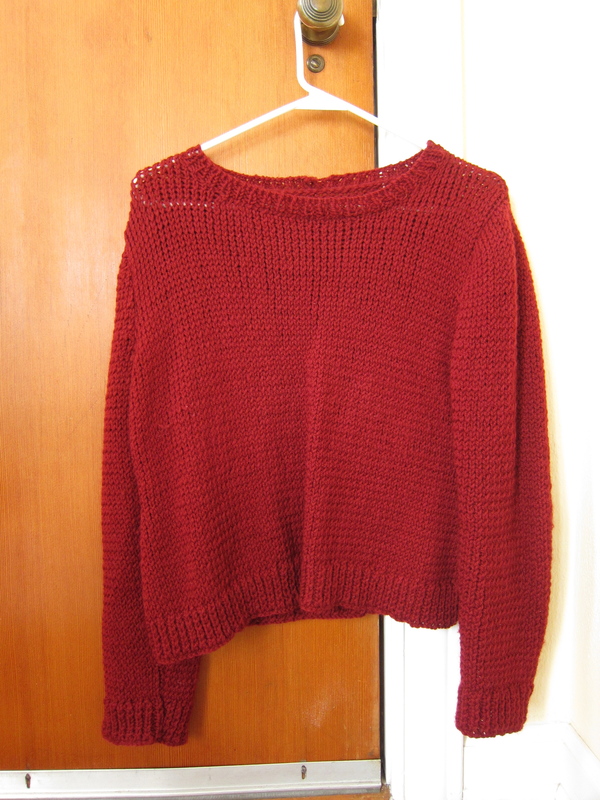 The pattern for this, if you are a masochist dedicated knitter like I am, can be found on Ravelry. It’s easy to knit, but putting all those pieces together? Oy. 1,080 pieces make up the rings, and the assembly alone took more than six months. As with all long-term relationships, there’s the thrill at the beginning. You can’t wait to get started and get to know each other. Each day brings new discovery and excitement, and you want to spend all your time with your new love. Then one day, you’re sick of your beloved. The relationship isn’t as easy as you thought it would be, and you want space. 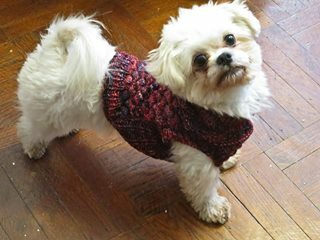 Maybe you cheat, taking on a smaller project on the side, such as making sweaters for your granddog, or patchwork throws from spare yarn. You have to re-evaluate your commitment. What all the cool dogs are wearing! Yet when the relationship is real and true, though, you hang in there until you get to the other side, and you fall in love all over again. You notice how the relationship stays with you even on your worst days, waiting patiently without judgment. It’s worth all the trouble and hassle and time. Under the bedspread at night, I am cozy and safe and secure, the same way I feel in a relationship that works. And as I enjoy the satisfaction of completion, I am buoyed again and know I can finish anything I start, even those pesky manuscripts that aren’t yet ready to release. With our beloved, whether a person or a project, if we hang in there, we can be more than we thought we could. Safe and secure and warm, we can soar. Do you have projects that take forever to complete? Please tell me I’m not the only one! After some searching, here’s the pattern I settled on. It’s easier than it looks, because I’ll make a lot of little pieces that I then sew together. Of course, making a lot of little pieces can get tedious. I started knitting the little colored strips…80 of them for each of 13 colors. I don’t like doing math, but I can tell you, that’s a lot, and those pieces represent just part of the quilt. It’s no coincidence that I’m revising a novel at the same time. Without boring you with all the little details, it feels much the same as working on this quilt. There is the whole that is the ultimate goal, which I’m reaching by working on thousands of little, tedious pieces. I’m reading The Wonder of Aging: A New Approach to Embracing Life After Fifty by Michael Gurian. Based on what I’ve read so far, it would appear that this new approach to quilting, writing, and life is a reflection of my age and current stage of life. I’m okay with taking time to work on the little details. Yes, I’d like to write books faster than I do, but I’m more interested in writing better. Eventually I’ll have enough of those little pieces done to put them together in one of the rings. Eventually I’ll read through a draft and say, yes, this one’s ready to go to the editor, because I’ve done my best. It seems curious and paradoxical to want to slow down the process. There is so much to write! So much to get done! Sometimes it feels maddening to become more deliberate, more thoughtful, less action-oriented. Yet somehow, I suspect, I will get more done. My drafts may go more slowly, but I will need fewer of them (I hope). In the end, I hope to have a beautiful heirloom quilt and a beautifully written book to share. Maybe it started when I was a kid, learning to do long division. I made up simple problems and practiced, over and over. One of my sister’s friends, observing this, either saw an opportunity to nurture my emerging geekiness or wanted to get rid of me (I suspect the latter), so she made up a big problem with lots and lots of numbers. “Try this one,” she said, laying down the gauntlet. Turns out that she was right; dividing a big number was exactly the same as dividing a small one. Thrilled with this new discovery, I spent far more time than is healthy for a young girl practicing my problems, making them bigger and bigger. I know, I know, I was a weird kid. I’ll get to the sauerkraut, I promise. In my 30s I decided to pick up embroidery. Did I try a simple flower to start with? Of course not. I bought a Noah’s Ark kit, complete with a literal boatload of animals, a rainbow, and a smiling, bearded Noah with his family. I drove myself crazy with that thing. 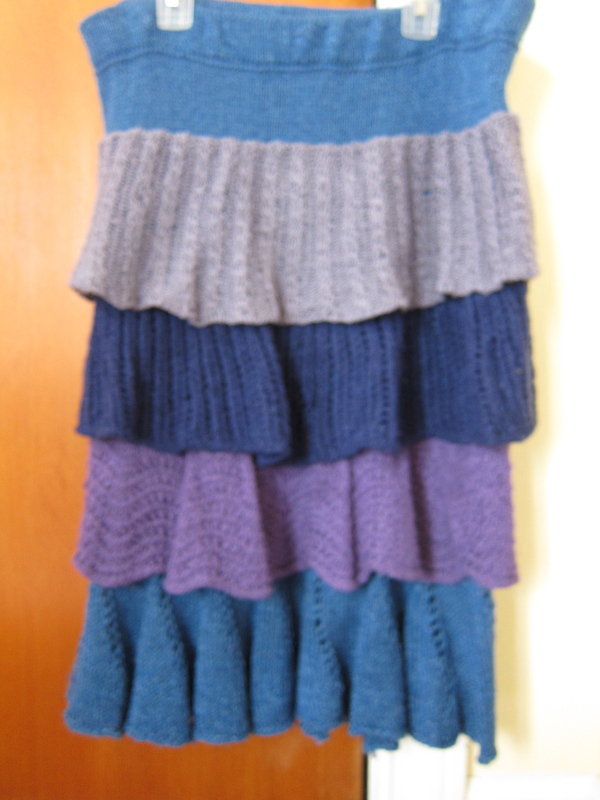 When I moved to Port Townsend, I saw many women around town with their knitting and decided that I wanted to knit, too. I’d learned at my grandmother’s knee, but hadn’t done much in, oh, a few decades. So of course, I started with a skirt. A lot of cussing and crying went into it, as I’ve written about on this blog, but I finished it. The Infamous Skirt. Thankfully, it’s finished and I wear it! 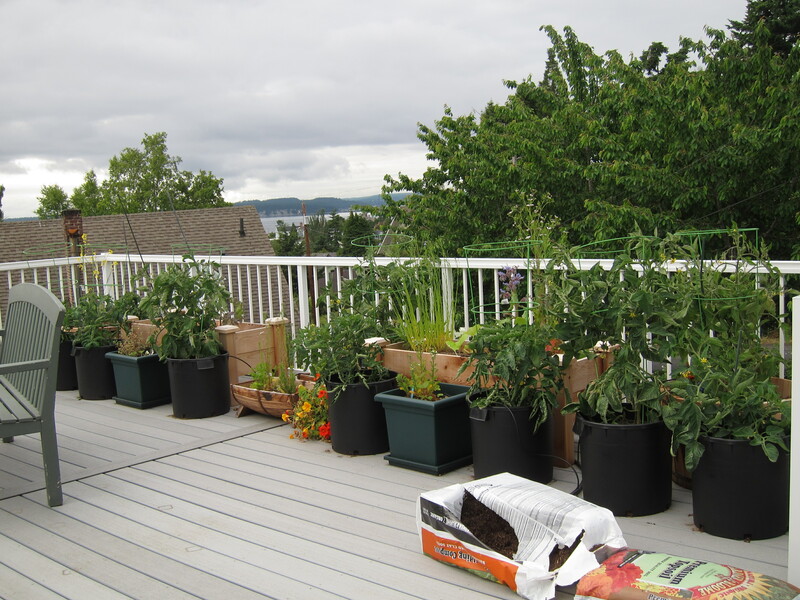 That same year, I decided to can tomatoes. Fifty pounds of them. A friend gently suggested that I could have started with ten pounds, but I was having none of that. I wanted enough tomatoes to last the winter. After all, canning fifty pounds is the same as canning ten, right? You just make more batches. I stood on my feet in the kitchen for two days straight, but by God, I got my canning done. Cussing and crying? Of course. When I first started working with a teacher to learn to use a spinning wheel, she looked at my first, tense efforts and said, “Ah. Overachiever.” Of course, that didn’t stop me from staying up late at night to practice, with more cussing and crying along the way. These are habits that I’ve lived with for nearly fifty years (I’m assuming that I wasn’t born this way, but I might be wrong). Can an old dog learn new tricks? Can I find the balance between curiosity and chaos? I figured out that if I work on a simple knitting pattern, I can watch television and chat with my hubby at the same time. Here’s something MUCH simpler, and it’s nice and warm in the winter! Which leads me to the sauerkraut. I’ve taken an interest in food fermentation. This relationship has built slowly over time. I’ve made my own yogurt off and on for years, and I prefer the taste of homemade yogurt to even the best store-bought stuff. Last year, after buying a bottle of kombucha (fermented tea) in a store, I finally felt like I’d found something to help me break my long-time addiction to a certain diet cola. While I haven’t entirely gotten “clean,” the kombucha helps. Since a 16-ounce bottle costs about $3.50 in the store, though, I decided to start making it myself as a practical matter. I don’t make fancy flavors, just the straight stuff, and I continue to be amazed at the fizzy carbonation that occurs on its own. Now I’m ready for the next step. I’ve bought a few books on food fermentation because I’ve heard about their health benefits. 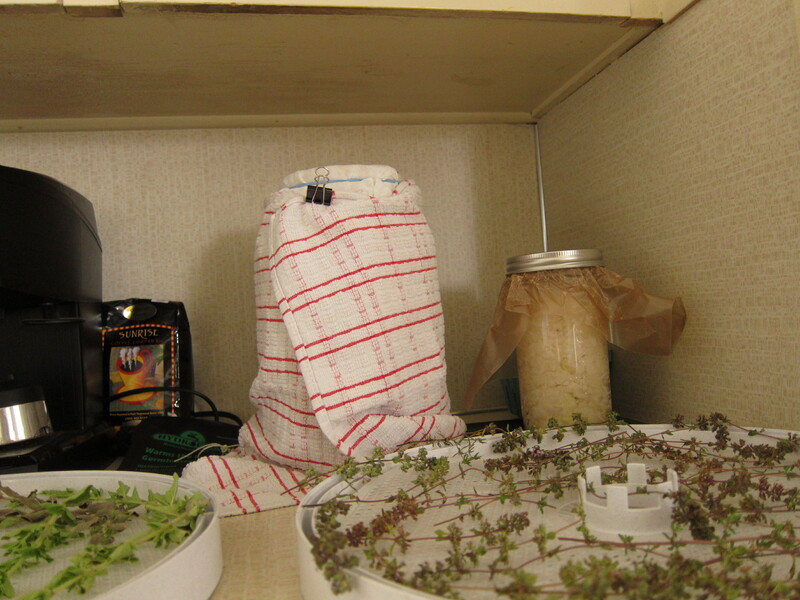 Plus, it’s a cool way to preserve food. The books all say the same thing: start with sauerkraut. It’s easy, they say. I don’t even know if I like sauerkraut. I remember eating the canned stuff as a kid, and I was NOT impressed. However, now that I’m eating garden-grown organic foods, I’ve discovered that I like carrots, radishes, and all kinds of foods that I thought I hated. So…this week at the market I bought myself a couple of kohlrabi, which, I’m told, makes a nice sauerkraut, and it’s now on my kitchen counter fermenting away. I took a little taste this morning, and it’s coming along nicely. As much as I love to learn, and as much as I enjoy playing “mad scientist” in the kitchen, what I am most proud of is that I’m learning to simplify. I don’t have to pick the most complex projects to start with, and I don’t have to try all the recipes at once. I can allow myself the adventure of trying something new without putting myself straight into overwhelm. After years of yoga and meditation, I have finally found some peace in a little Ball jar of sauerkraut. In my defense, I planted these from seeds, which is why I ended up with so many! Yesterday I turned 54, a number that I find somehow surprising. Physically, I feel no different from when I was younger. In fact, in many ways I am stronger and healthier than I was then. I’m still limber enough to surprise an unsuspecting massage therapist who decides to stretch my legs. It wasn’t always so. At age 26, when I first took up yoga, I couldn’t touch my toes, so I’ve gotten better with age. Mentally, I feel smarter and wiser, though part of being smarter and wiser is knowing that you’re not so smart or wise. I still take delight in learning new things. This year, my education centered in the home as I learned the arts of canning food and spinning wool. We took a big step several months ago and moved from Houston, where I had lived for 30 years. I never thought I would stay there for the rest of my life, but this year, I finally knew where I wanted to go. It’s been a good decision, and I’m excited about where I live now. If there is a looming discontent, it’s about the increased urgency to leave a legacy. I’ve putzed around with my writing this year, and I’m ready once again to get serious. I don’t want to beat myself up about it; after all, moving cross-country, from a red state to a blue one (sigh of relief), from a major city to a small town, takes some getting used to. Even though I didn’t write as much as I wanted, I felt as though I was gathering new material that would turn up in my stories. Now, though, I want to roll up my sleeves and git ‘er done. I have several books in process and a Google doc file full of ideas, so I need to get on with it. With my health, I can probably expect many productive years left, but we never know at this point. I’ve said goodbye to friends who didn’t make it this far, so I don’t take my life for granted. I just started reading Neil Young’s book, Waging Heavy Peace. Though I’m not too far into it, what I find most interesting is that he’s looking forward, engaged in new projects that excite him. In fact, he covers quite a bit of ground before he gets into the “memoir” part of it because he’s so involved in what he’s doing now. I love his restless, chaotic, inventive spirit. As I begin another year in the unstoppable march of time, I hope that I can follow his example.